Home Unlabelled New Yazmo Traincase & Updated Kit Video! New Yazmo Traincase & Updated Kit Video! I have a really exciting video for you! I personally love watching other Makeup Artist Traincase videos and I finally have a new one up! In this video I'm showing off my new fabulous traincase from www.Yazmo.com and also giving you an updated look into my kit. Check it out! Here is the lovely traincase closed (picture from www.yazmo.com). It's got an extending handle in the back to let you roll the case. There are two stands at the bottom to help keep the case sturdy when not in motion and two sets of 3 wheels each in the back to help smoothly transport it. Here is the traincase open. It's lower but wider than my Zuca but interestingly enough fits as much product as my Zuca traincase and backpack together. It's got a sturdy frame and soft sided outside which makes it much lighter and easier to transport that traditional hard sided traincases that can be too bulky. On the back of the lid you get a brush roll with clear flap. It's adhered with velcro. I like to work directly from the lid so that I don't have to carry a brush belt or waste table space laying out my brushes. On the outside of the traincase there are more velcro straps so that you can attach the clear cases that come with the traincase. 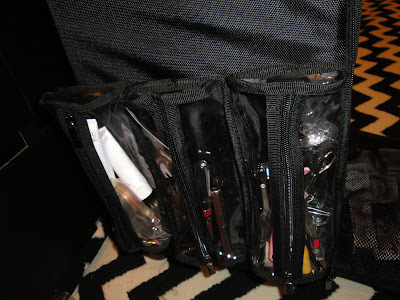 Here are 3 pencil style cases that are super convenient for organizing products. Here's a shot of the velcro - it's super sturdy. Having these packs on the outside makes it super easy to reach products quickly. I absolutely love how when you unzip the main compartment you have two sets of 4 drawers for a total of 8. I place labels per drawer to better organize them and allow me to know what's in each. The drawers require you to push down on the middle button before opening. That way, you don't have to worry about the drawers sliding open during transport. I literally work out of the drawers which requires very little set up and clean up and I also don't need a lot of table space to display my product. Now onto the nicer pictures. I took some close up shots of the different components in my photography backdrop. 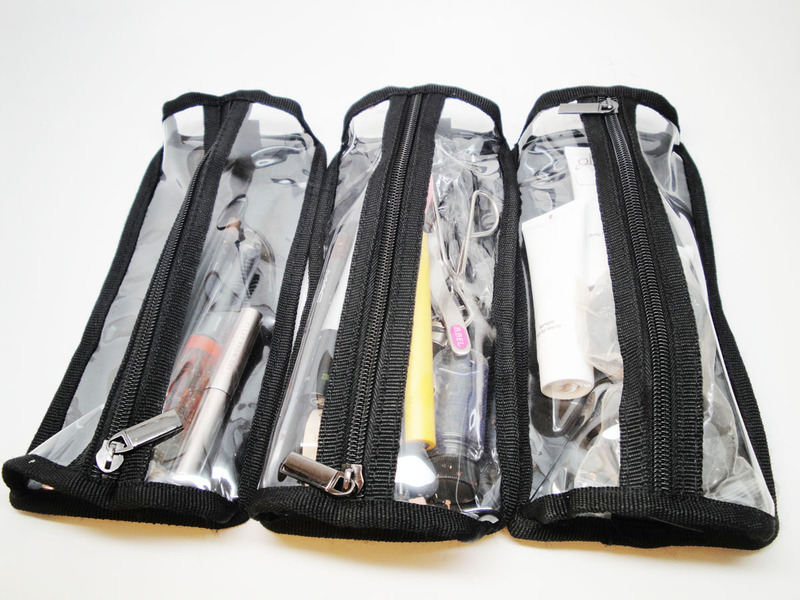 Here are 3 of the clear plastic pouches you get with the case. 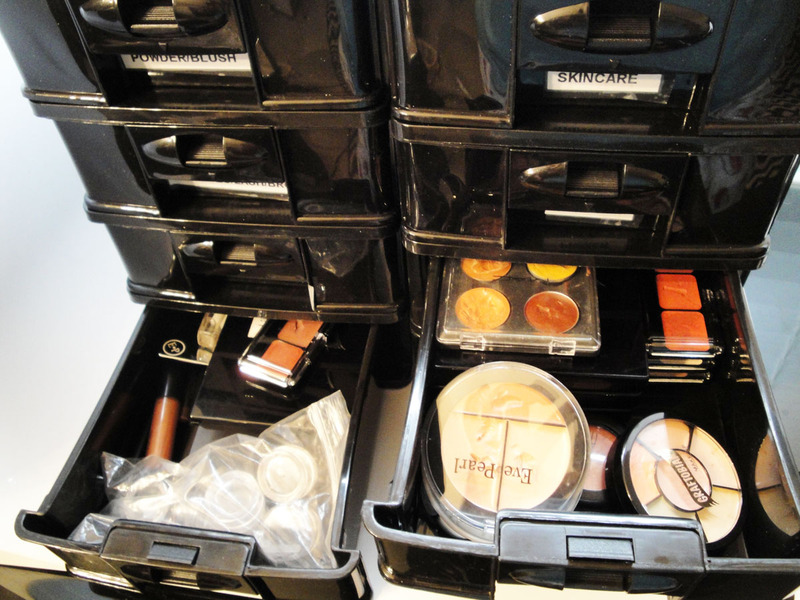 In the left I have brow products, the middle I have liners and mascaras, and the right I have body shimmers and bronzers. It's easy to see, clean and keep organized. When these were attached to the outside of my traincase they did not fall off and felt secure. More of the clear packs - one has a slot for tissues, and the two other are larger zip cases with clear tops. I use one for my emergency touch up kit and another for housing airbrush components. 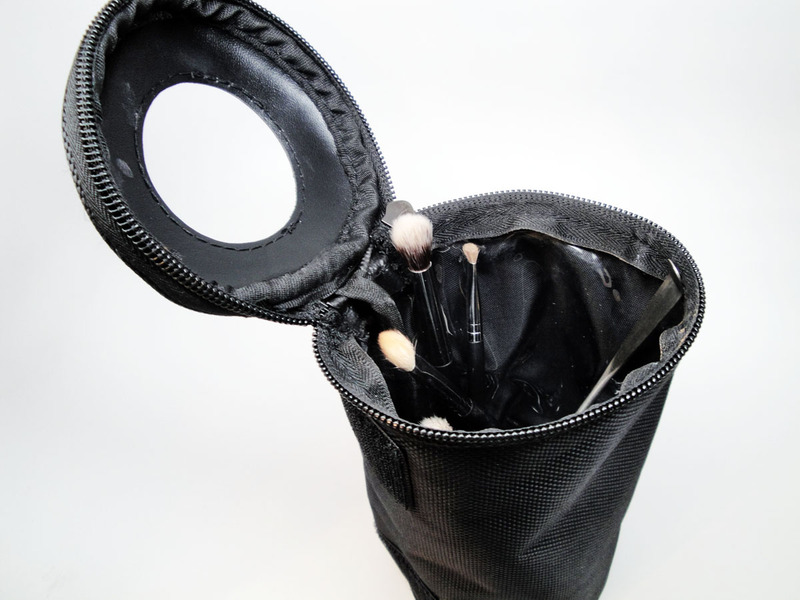 You can attach these to the outside of the traincase, where the brush roll is attached, or in the larger top open compartment. 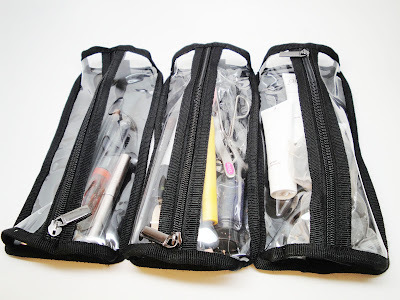 Clear, durable plastic is a must-have for makeup artists as it's easy to clean and see your products. This case is really neat. The cylinder shape has an open top and is great for wipes in a tube container. I also use it as a brush cup! 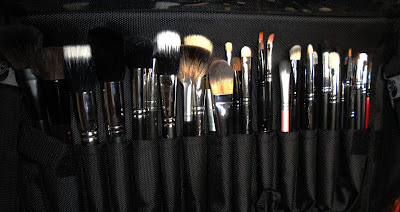 I kept it attached on the side of my traincase upright and used it to store dirty brushes when I was done with them - genius! A better look at the drawers - they fit a ton of product. The drawers are sturdy and slide open and close easily. They are big enough to fit the largest pro and domed z palettes with room to spare. Close-Up of the brush roll. The spaces are rather large so you can fit multiple brushes per slot. Here's a shot of the open container at the top. I love that it's a large free form space so you can put the larger items in there that won't fit in the drawers. It's also great for storing hair supplies. I was able to fit all of my airbrush equipment along with powder stacks, large palettes and sponges. I really do like this traincase a lot. It's the perfect size for both small and large gigs. It's bigger than my smaller original yazmo soft sided rolling traincase that I love, but also much smaller than having to lug around my zuca and backpack. 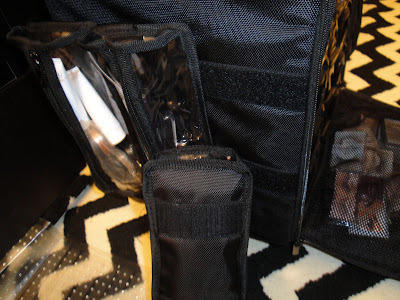 The case does get heavy since you can pack so much product into it so be aware - but I did find it very durable when I used it on a recent gig. I've had many Yazmo traincases for years - I find them a very affordable option and their cases to be very unique and functional at the same time. The huge selling points for this case is the ample size, the organizer drawers, and large space at the top. 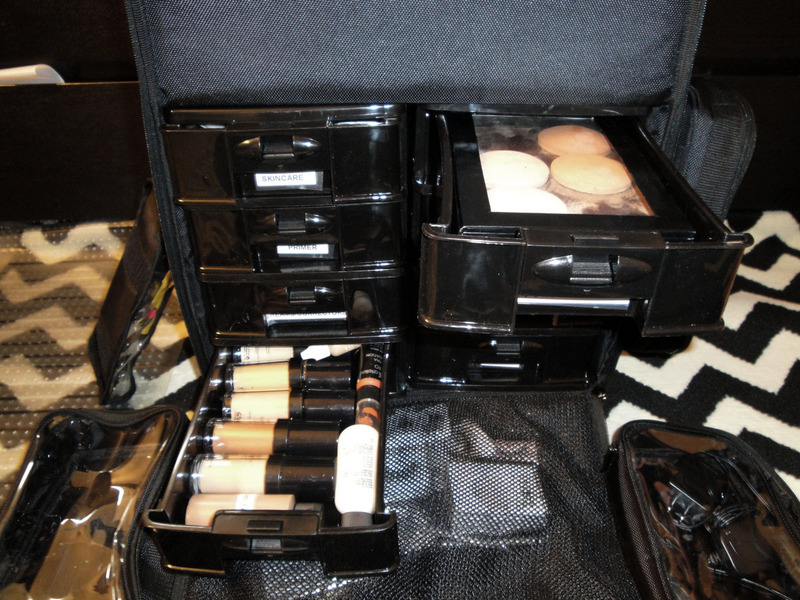 You can essentially work from this case alone and don't have to worry about having a large table to spread out your makeup - something you don't always get as a makeup artist. Set up and clean up time is also dramatically reduced. If you have any questions on this case, please let me know in the comments below! 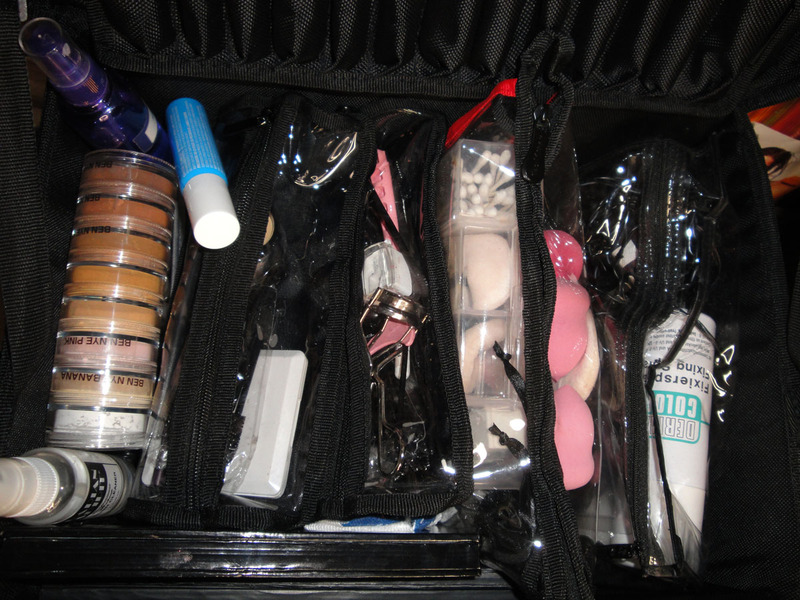 I plan to have a Kit Essentials Video where I go over these products in detail, stay tuned! Get Ready with Me - MAC Riri Woo Glam! 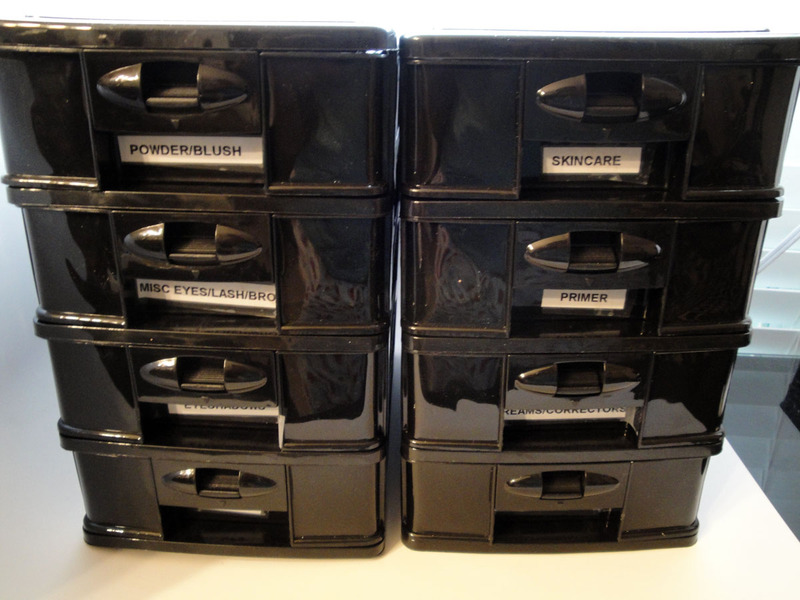 June 2013 Beauty Favorites & Giveaway!